I've spent the last few days down in Oxford, working on the fragrance counter of our shop there and enjoying some Christmas cheer with my friends. We're back in Nottingham now, but I'm unpacking one bag only to pack another as we're about to head off to France to spend Christmas with C's parents in the Loire Valley. A few days working on my feet in a shop and I quickly realise how comfortable life behind a desk can be. I'm knackered....although, to be fair, some of that may be down to food I've been eating and the booze I've been drinking, especially last night's delicious cocktails. I've also watched both "Trading Places" and "Anchorman 2" already today, so I'm emotionally drained too. As is my custom at this time of year, I've made a donation to Shelter as a small thank you to everyone who has stopped by here over the last year to read me wittering on about this and that. Every morning last week, I walked the couple of miles down the hill from Headington into the centre of Oxford, and every day I walked past several homeless people. It's not been especially cold yet this winter, but it's certainly not nice to be out on the street at this time of the year. 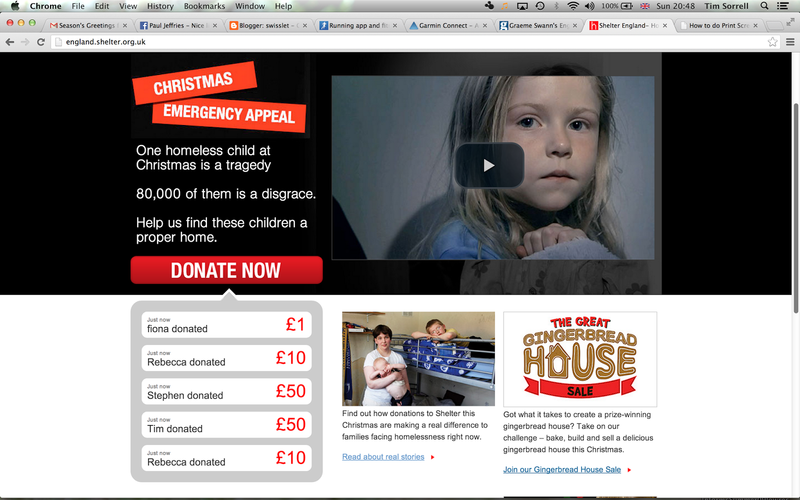 Shelter's Christmas campaign this year is trying to raise awareness of the 80,000 children in this country who are homeless. That's an astonishing and shocking figure. I'm not one for religion, as you know.... so here's hoping that you all spend some time with the people you love over the next few days. Life is short and friends are precious. Stay classy and see you all on the other side.